7 P.M. Potluck: Please Bring your best dish to share. Coffee, tea, and filtered lemon water, as well as serving utensils will be provided. 8 P.M. Presentation: Program begins promptly. Travel back in time to the early days of LA’s movie-making magic and listen as THS board member Eric Dugdale tells tales from before film had sound. Featured in his discussion will be pioneering producer Thomas Ince, who filmed Westerns in our hills. Ince became known for using real Native Americans in his films, providing a school for their children and promoting them within the film industry. He was blood brothers with actor and Sioux Chief William Eagle Shirt. Come hear more about Topanga’s early days as a Western film mecca. You will be able to join or renew your THS membership during the program ($20 for individuals or $30 for families). We deeply appreciate your support! Also, please bring some cash to donate, to help defray our expenses. 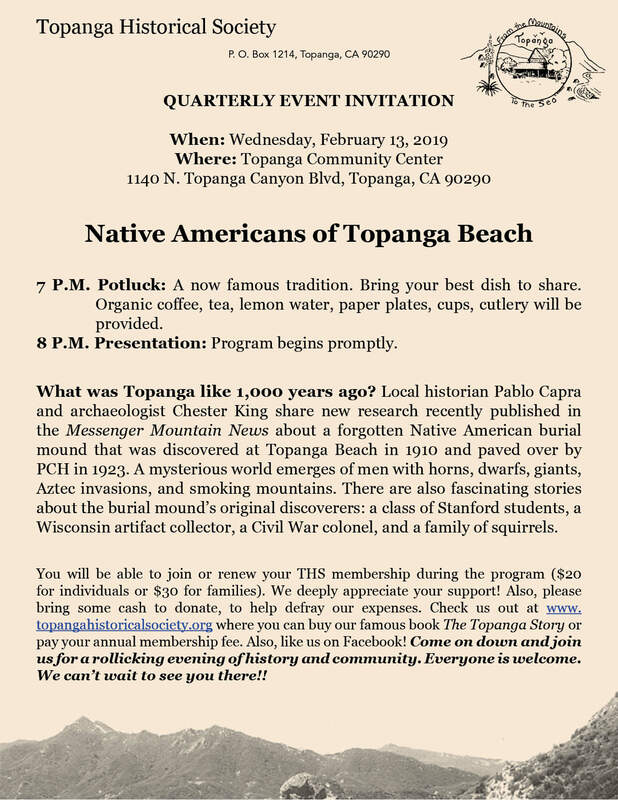 Check us out at www.topangahistoricalsociety.org where you can buy our famous book The Topanga Story or pay your annual membership fee. Also, like us on Facebook! Come on down and join us for a rollicking evening of history and community. Everyone is welcome. We can’t wait to see you there!! 7 P.M. Potluck: A now famous tradition. Bring your best dish to share. Organic coffee, tea, lemon water, paper plates, cups, cutlery will be provided. What was Topanga like 1,000 years ago? 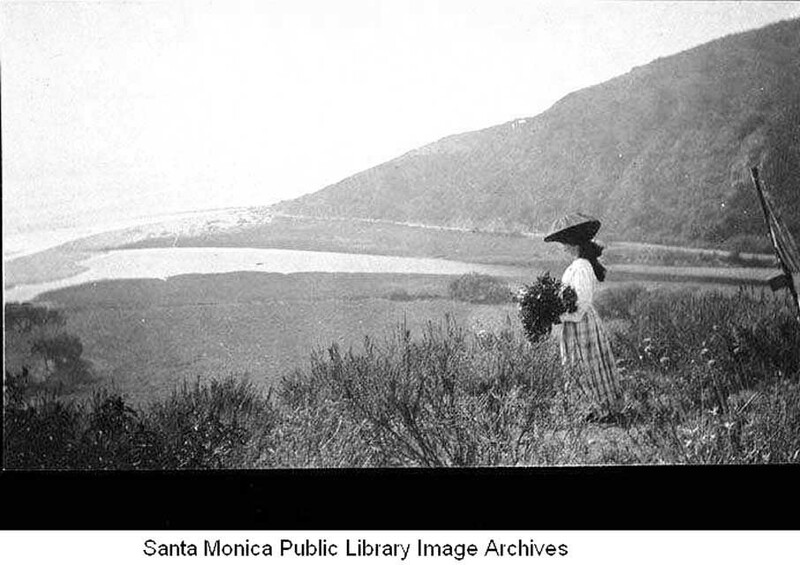 Local historian Pablo Capra and archaeologist Chester King share new research recently published in the Messenger Mountain News about a forgotten Native American burial mound that was discovered at Topanga Beach in 1910 and paved over by PCH in 1923. A mysterious world emerges of men with horns, dwarfs, giants, Aztec invasions, and smoking mountains. 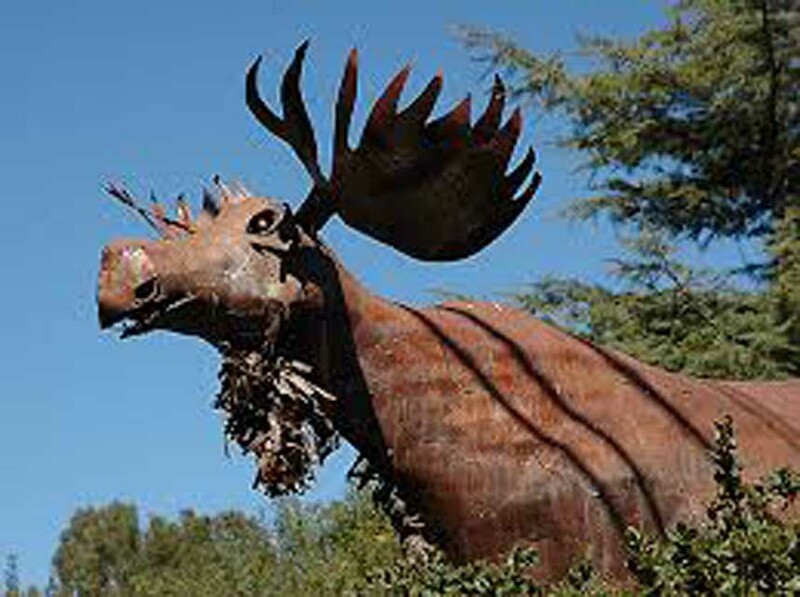 There are also fascinating stories about the burial mound’s original discoverers: a class of Stanford students, a Wisconsin artifact collector, a Civil War colonel, and a family of squirrels. You will be able to join or renew your THS membership during the program ($20 for individuals or $30 for families). We deeply appreciate your support! Also, please bring some cash to donate, to help defray our expenses. Come on down and join us for a rollicking evening of history and community. Everyone is welcome. We can’t wait to see you there!! Meet-and-Greet Pine Tree Circle’s New Owners and Enjoy The Newly Hung Historical Vintage Business Signs at the THS Office! 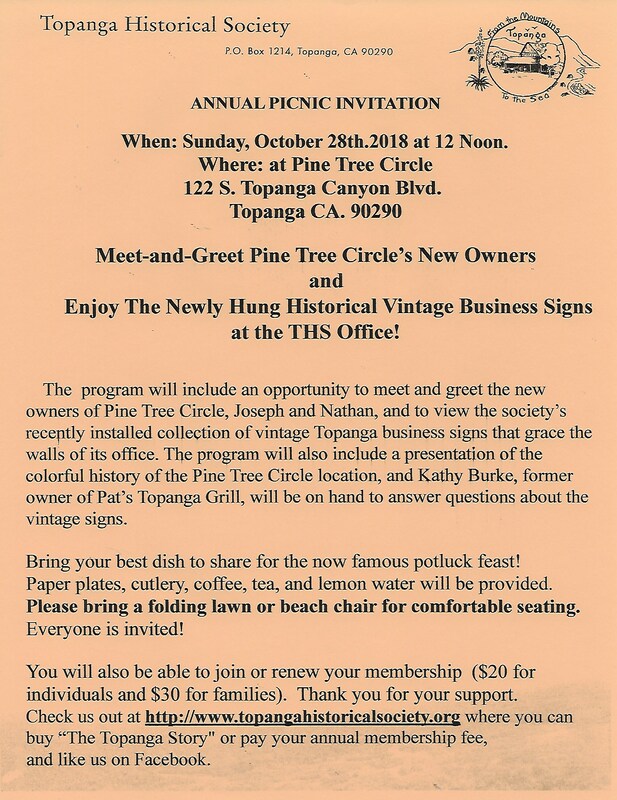 Topanga’s Pine Tree Circle shopping center is the site for the Topanga Historical Society’s annual picnic to be held on Sunday, October 28th, at 12 noon. 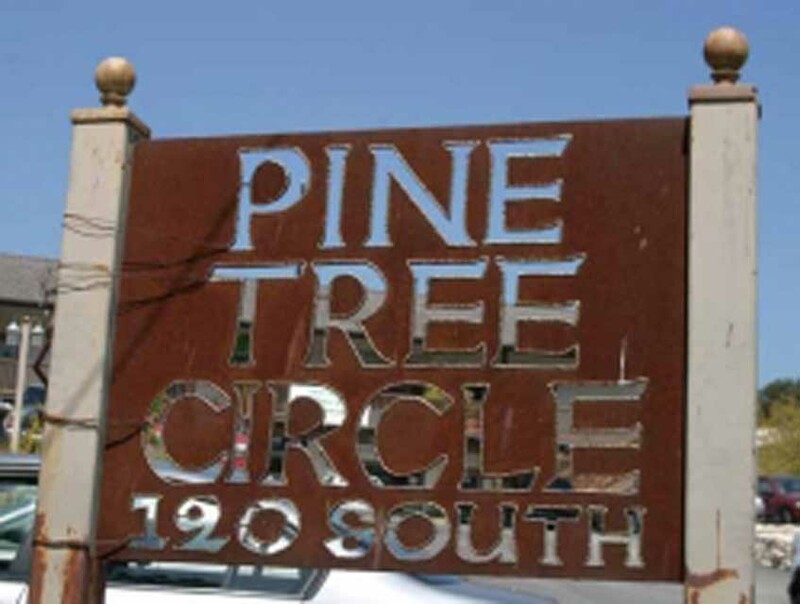 The program will include an opportunity to meet and greet the new owners of Pine Tree Circle, Joseph and Nathan, and to view the society’s recently installed collection of vintage Topanga business signs that grace the walls of its office. The program will also include a presentation of the colorful history of the Pine Tree Circle location, and Kathy Burke, former owner of Pat’s Topanga Grill, will be on hand to answer questions about the vintage business signs. Bring your best dish to share for the now famous potluck feast! Paper plates, cutlery, coffee, tea, and lemon water will be provided. Please bring a folding lawn or beach chair for comfortable seating. Everyone is invited! 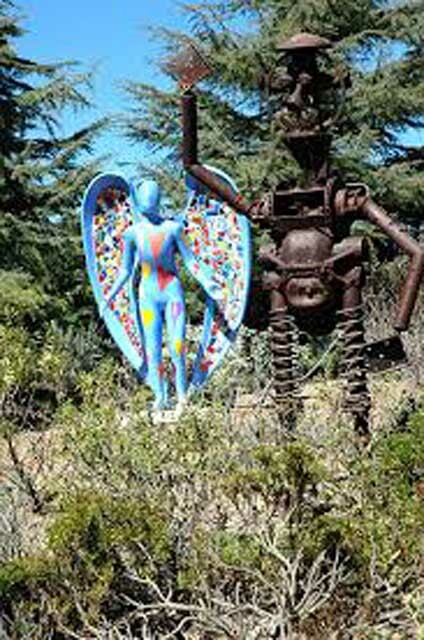 Pine Tree Circle is located at 122 N. Topanga Canyon Blvd. Please join THS at our quarterly event for our Signs Unveiling and Board Election on Wednesday, July 25, 2018, from 7-9pm at the Topanga Historical Society Office, 122 S. Topanga Canyon Blvd., #206, Topanga, CA 90290. Looking forward to seeing you all there!